But it’s as good a time as any to launch a new effort to fix aging systems — and get better at actually collecting taxes — as Congress and the White House appear ready to open the appropriations spigot once again after years of cutbacks. The renewed bipartisan interest comes as the cash-strapped tax collector confronts another filing deadline Monday, amid much confusion surrounding the effects of the 2017 tax overhaul. The agency reported last week that visits to the IRS website were up 10 percent from the previous year, to 376.7 million as of April 5. Upgrades to the agency’s systems could allow taxpayers to receive callbacks instead of holding through the agency’s notoriously long waiting times. Required in-person visits by identity theft victims would be eliminated in favor of web solutions. Taxpayers would have online accounts, like they do at banks. Updated data analytics would target tax cheats and help the agency’s shrunken enforcement staff be more efficient. The need to modernize the agency “will forever remain a top priority” as the IRS is charged with safeguarding a “vast amount of sensitive financial and personal data,” Rettig said in testimony before Congress last week. And that’s where the car talk came in. Asked about whether that vast amount of taxpayer data is at risk as it resides in a 60-year-old system still programmed in abandoned computer languages, Rettig told the House Financial Services Appropriations Subcommittee the information was safe for now. In this latest modernization effort, Rettig, formerly a lawyer who represented individual and corporate taxpayers before the IRS, faces obstacles his predecessors weren’t able to overcome. The agency’s ancient core systems are the Individual Master File and the Business Master File applications. Olson wrote in a February report that “for the last 25 years the IRS has tried — and been unable — to replace them.” Besides representing the interests of taxpayers, the advocate is charged with recommending systemic changes to the agency. While the IRS has added new systems over the years, Olson said that was akin to adding more floors to a rickety building. No matter what the new feature is, if it has to interact with individual taxpayer data it goes through the ancient IMF application. The latest effort, started in 2009, has been to replace the IMF with the new “Customer Account Data Engine 2,” but that transition hasn’t been accomplished yet. Besides storing taxpayer records, the IMF’s base code reflects every change in the tax code since 1962. The logic of that code and its outdated language is understood by “an extremely small number of IRS personnel,” the agency said in a fiscal 2020 budget document that proposes a new $80 million effort to apply modern programming languages to the most complex areas of the IMF. IRS funding challenges have not only handicapped modernization plans but also efforts to be more responsive to taxpayers. The agency’s chief reason for being, collecting taxes, has suffered as lawmakers started dropping the budget axe on the agency in 2011, when Republicans took over the House, after the IRS budget hit a multiyear high at $12.1 billion in fiscal 2010. The deficit reduction law enacted in 2011 didn’t help matters, and the situation further deteriorated in 2013 when a raft of scandals eroded confidence in the agency. That was the year an overly expensive $4.1 million conference and $50,000 in undocumented expenditures on filmmaking came to light. It was also the year allegations arose that the agency had targeted ideological nonprofits and threatened their tax-free status. Adjusted for inflation, the Congressional Budget Office estimates the agency’s budget dropped 20 percent from fiscal 2010 through fiscal 2018. The biggest hit has been to enforcement, resulting in the share of returns audited dropping from 0.9 percent in 2010 to 0.5 percent in 2017. But thanks in part to a two-year budget deal lifting the tight caps imposed in 2011, appropriations started to rise again in fiscal 2018, and if appropriators give the agency what it is asking for in its latest budget request, funding would surpass fiscal 2013 levels for the first time next year. That is, if lawmakers and the Trump administration can agree on another spending caps deal to avoid a steep 9 percent across-the-board drop in fiscal 2020 nondefense spending. Driving the increase would be a big rise in modernization dollars. 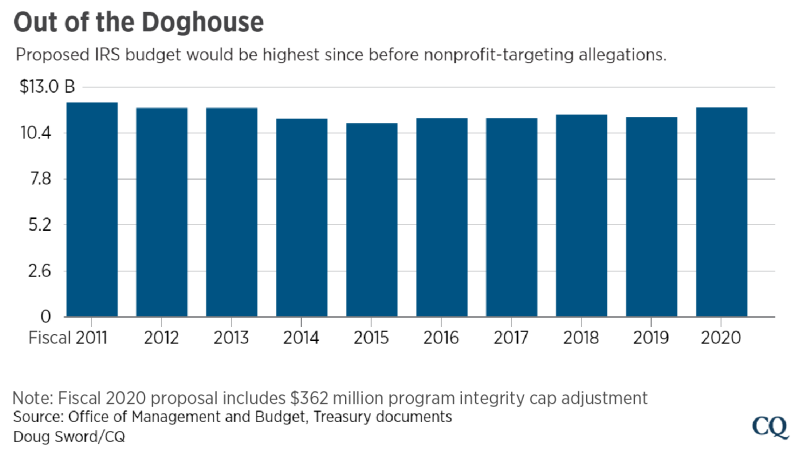 The IRS is seeking $290 million for its main modernization account, or nearly double the current fiscal year’s funding. Fiscal 2020 would be the first of Rettig’s six-year modernization program, but a parallel funding stream could provide even more information technology dollars. House Democrats have already signaled approval for a $362 million “program integrity” adjustment the Trump administration is seeking to provide additional money above regular nondefense spending caps, for fiscal 2020 enforcement efforts. That would be the first year of a 10-year, $14.5 billion effort to devote more resources to collecting taxes. The Trump administration has proposed such a cap adjustment before, but the GOP Congress didn’t go along. Now they have an ally, at least in this instance, in House Democrats. The House Democrats’ bill to increase discretionary spending caps, which didn’t advance last week due to objections from liberal caucus members, signaled support for the first two years of the program totaling $1.15 billion. Up to $400 million would be allowed in fiscal 2020; that figure is also enshrined in a “deeming resolution” House Democrats adopted last week in lieu of the caps legislation to provide some structure for appropriators to start writing their bills. Even before the recent budget cuts, the IRS’ problems with enforcement were evident. The agency estimated that during 2008-10, the “tax gap” between what’s owed and actually paid was $458 billion. Newer estimates from the Urban-Brookings Tax Policy Center put the gap now around $600 billion. Pumping an added $14.5 billion into enforcement over the next decade would pay for itself, Rettig told appropriators. The White House estimates ramping up and modernizing enforcement will bring in $47.1 billion in additional tax revenue over 10 years. “A robust enforcement effort assures compliant taxpayers that those who fail to comply risk the consequences,” Rettig said.